Come visit us in our new health center located at Stonewall Commons, just off I-79! 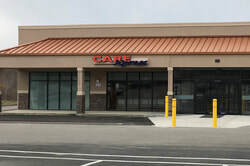 CareXpress offers an array of medical services including comprehensive primary care and chronic disease management and walk-in acute care for non-chronic, non-life-threatening, illnesses and injuries. CCWV offers family planning services and participates in BCCSP. For children, immunizations are available through the VFC program and private insurances. Community Care's CareXpress in Weston has received a Level 3 accreditation — the highest possible — from the National Committee for Quality Assurance (NCQA) for providing exceptional service and high quality care. As part of this expanded care management assessment, the health history of all patients is reviewed to assure that each has been screened for chronic conditions including high blood pressure, high cholesterol, depression, weight management, physical activity, and asthma. Other risk factors, such as pregnancy, co-morbid conditions, or family history of disease, are also assessed.